This week on “Banter with Ben and Lisa,” Ben Mandelker (bsideblog.com) and Lisa Timmons (twitter.com/timmonslisa) discuss some of the fall television they’re excited for. Plus, it’s an update on “Operation Seduction” with talk of Wentworth Miller’s recent coming out of the closet. The two also discuss Ben’s internship experiences at “Late Night with Conan O’Brien,” the WWE, and “Strangers with Candy.” As a bonus, there’s talk of Yom Kippur and Halloween, naturally. Come listen! And remember that if you use the promo code “banter” at godaddy.com, you can nab a .com for only $2! That’s like the cost of a king-sized pack of m&ms. But so much more useful! Lock down that domain before anyone else does! AND WHATNOT: The Most Amazing Grilled Cheese Ever? Also, Emmys, Bad Dressers, Takoyaki, and Tomatoes! Hollywood Life: Youâ€™ve Seen The Best, Now Check Out The Worst Dressed From The 2010 Emmy Awards! Starcasm: PHOTOS Bethenny zaps Jill Zarin and Kelly Bensimon with shrink ray? 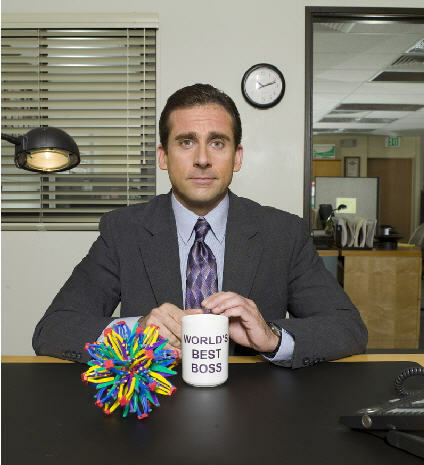 Dunder-Mifflin fans take note: Steve Carell has informed EW.com that he will be leaving The Office after this upcoming season. That’s right: we won’t have Michael Scott to kick around anymore, which now leaves us to wonder if the venerable sitcom can survive without its biggest star. On the one hand, it seems impossible — I’m not sure audiences will love being stuck with the smug Jim Halpern in charge. Then again, The Office has thrived as an ensemble comedy, with various supporting characters moving in and out of the mix. Maybe the producers can pull off yet another ingenious bit of casting (they’ve done it many times before). Or maybe one of the old standbys can return to glory (ahem, JAN). Or maybe the reigns will simply shift to fellow Dartmouth classmate Mindy Kaling, what with her being a media darling and all. Movieline has compiled a nifty list of possible actors and actresses to fill Carell’s shoes, but I’m sure there are greater possibilities out there. Who would you like to see take over The Office? Or should it simply die a graceful death?